A while back I was awarded a "blogger" award, but forgot to send the love out like I was supposed to. Yesterday afternoon, I got an email from Angela saying that she was nominating me. Well, I'm not forgetting this time! 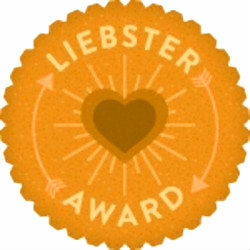 The Liebster Award is given to up-and-coming bloggers (from other bloggers) who have less than 200 followers. Basically a pay-it-forward award to help spread the love to some of your favorite blogs. Liebster is a German word that means sweetest, kindest, nicest, dearest, beloved, lovely, kind, pleasant, valued, cute, endearing, and welcome. Tell 11 random facts about yourself. Answer the 11 questions the nominator has asked you. Choose 11 new bloggers (with less than 200 followers) to pass the award to and link them in the post. Create 11 new questions for the bloggers you pass the award to. Go back to nominees' pages and let the blogger know about the award. I love writing on paper. The way the pen or pencil flows across the page is amazing to me. That my hand puts down my thoughts? Coolness. I use the word "awesome" a lot. April is my favorite month - it's my birthday month! I love necks! Especially baby's necks - they smell so good. I also love quotes. Words strung together to say exactly what I want to hear is sheer perfection to me. I like containers - you know, like tupperware and stuff that stores stuff. Heaven! We've started going to church this year - I love looking over at my family when we're at church knowing we are there to worship Him. Awesome! I started 2013 as a workout goddess...well, now that I've gone back to school I've lost the energy and motivation to work out. It makes me sad. I try to be really out-going and friendly with people I just meet. I was told a long time ago that I looked stuck-up when they first met me...I don't ever want anyone to think that again. 1. What is your favorite accessory? 2. If you could have any super-power what would it be? 3. If you could travel to anywhere in the world, where would you go? Italy - I love the food! And I think it would be awesome to learn italian while living there. 4. What is your favorite kind of dessert? Anything chocolate-y. I also like lemon-y. Just not together. 6. If you could meet any famous person (dead or alive)who would it be? I would love to meet Giada De Laurantiis or Ina Garten. Actually, I just want to be in the same room with one of them while they're cooking. The Notebook by Nicholas Sparks. It was one of the first books I couldn't put down. 8. What do you do to unwind? Take a bath and read a book. Early bird, for sure. Annoyingly so, actually. I have a bracelet I wear on my left wrist. My husband has the male version. When we're holding hands, the bracelets touch and it makes me happy. Editor at a publishing house...that's what I wanted to do when I was younger. Wow, you actually finished reading this? You should get an award for just doing that! I love that you guys have bracelets... that's different and adorable =). Congratulations on your Liebster, and thank you again! Yay! I'm so glad you found me through Angela! I just started following you and I can't wait to read more about you!